Transforms Workshop mode into a God simulator - giving you all of the tools you need to create amazing settlements. Flight, Undo Buttons, Layers, Cloning Tools, and more! Mod Configuration Menu Only some features require this. -Fixed an issue that could cause some papyrus log spam on a new game. -The blueprint controller object will once again correctly display all layers when creating a blueprint. -An invisible floor piece will now be placed under you temporarily when you choose to rename a blueprint. - This should make it so you no longer have to be on the ground in order to use the naming feature immediately if you were flying around in WS mode while the blueprint was being created. -Your body is no longer removed when in flight mode, this allowed for reducing the delay before you can access your Pipboy after exiting WS Mode. -Falling damage prevention when exiting WS Mode from flight will now work even if you had armor that prevented a portion of falling damage. Previously, if your armor only offered partial protection, you could die after falling from flight in WS Mode. -Added Auto Clear Weather setting to MCM/Holotape. This changes the weather to the area’s clear weather type upon entering Workshop Mode. -Fixed the holotape control for Auto Change Layer setting. -Powered workshop objects placed by building a blueprint will now have their powered animation set to the correct state so that they will work immediately the next time the power grid is updated, which triggers any time you run a new wire connection. -When you first load this patch, you will receive a series of Added/Remove messages. This is to fix your blueprint objects which will all be moved to the Blueprint Storage. If you haven’t renamed your blueprints, you will want to do so before installing this patch to avoid them stacking. -Layers added to the default layer will no longer be flashed purple. This means that players not using the layers feature won’t have to see their items flashing. -Added two options to MCM/Holotape to control whether the purple flashing occurs on items, the first option affects items added to the default layer, and the second affects items added to any layer. -Items built before installing Workshop Plus will no longer be added to the default layer automatically. This will reduce overall system load, as doing so can be very intensive, especially in complex settlements. For most players - there is little advantage to having those items on the default layer anyway. --There is now an MCM/Layer Control Module “Add Previous Items to a Layer” tool you can run on demand. -Fixed an issue that could prevent items from being moved to a different layer when a layer is cleared or deleted. -Layers will now correctly be removed from the layer select menu when they are deleted. -After deleting a layer, if you chose to move the items on it to a different layer, that different layer will be made active instead of just the next one in the list. (For example, if you deleted layer 1 and moved the items to layer 4, layer 4 would become active. Previously, layer 2 would have become active, which was not intuitive). -Added an option to MCM/Holotape prevent the hotkey warning from firing when you press a WS+ hotkey outside of workshop mode. -Fixed an issue that could cause log spam about being unable to call Stop() on a None. -The vanilla keyword ActorPreventSubsegmentDamage can be added to objects to prevent them from being added to layers when built. -Objects being added to a layer will now flash purple for a moment. Previously these were flashing green which is used for several other actions. Going forward, distinct highlight colors will be used for various actions. -Added support for Blueprints. Blueprinting allows you to create a copy of a layer that you store as an object. You can then build copies of that layer in any settlement. --You can build a Blueprint Controller from the Special menu. --After building a Blueprint Controller you will be presented with a menu with several options. --The options will allow you to organize your blueprints, create a new blueprint, or build an existing blueprint. --Creating a blueprint involves scanning a particular layer and generating an inventory object you can name and use later to build a copy of that blueprint. --When building a blueprint, the Blueprint Controller is used as the center point. All objects in the blueprint will be created around it in the same relative positions they were in your original design. All items are then attached to the Blueprint Controller so you can easily fine tune the position after it finishes building by just picking up the controller and moving/rotating it around. --Building the Blueprint Controller again will move it so you can fine tune the angle you are moving and rotating the items from. --Blueprints are stored in your inventory at first. They are weapon records so you can rename them. After creating one you will be offered an invisible weapons workbench to name your blueprint immediately. --It’s important you name each blueprint so they don’t ever stack together. Though it will cycle through 10 different names in case you forget to name one and will TRY to warn you if you make it through all of the default names. --If you drop a blueprint on the ground it will be transported to a free storage space that the Blueprint Controller can always see and access. This way you don’t have to keep them in your inventory after naming them. --All blueprints in your inventory are also automatically moved to Blueprint Storage after you start construction of a blueprint. -Added new Hotkey to toggle the “Auto Change Layers On Move” setting. This setting makes it so that each item picked up in workshop mode is added to the active layer. -Added new section to the top of the Layer HUD panel to display certain settings that are toggled on. --Currently this only shows one, but will be expanded in the future. This is the “Auto Change Layers On Move” setting will show a “plus” symbol when enabled, so you know at a glance if things you pick up are going to be moved. -Your footstep sounds are now muted when flying in Workshop Mode. -Invulnerability now includes protecting you from Rads as well. -Fixed a bug with Clear Highlighting on Workshop Exit that made it not work at all, nor would the settings change save. -Greatly improved the layer duplication code. Should be substantially faster, and will no longer back up the script queue. 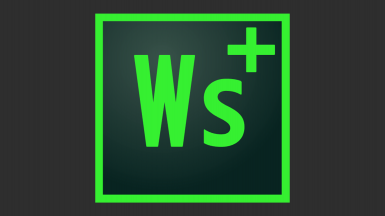 -WS+ will now post a warning pop-up if you forget to update Workshop Framework to the version it requires. --Layer Handles allow picking up and even cloning a layer. --Layer Handles can be built in workshop mode, or hotkeyed with MCM. --When a Layer Handle is built, it will switch to a version with the active layer number floating over it. It will then attach itself to all items on the current layer. --The Layer Handle model is special. It has a square around the number that will highlight red when you should NOT move it, and flash green once it’s OK for you to move it again. ----After you first build it and it is attaching all items (you will see the items flash blue as they are attached). Moving during this will cause some items not to be attached. ----When you are cloning the layer handle. Moving during this will cause some items to not clone in the positions they were at when you pressed the button as it takes a few seconds to copy all of the coordinates. --WARNING - It is not recommended to pick up the Default Layer handle unless you had scrapped the entire settlement. Any objects that aren’t buildable in Workshop Mode will disappear when you pick up the layer handle. This means scrappable objects or things you can’t built yourself, such as items placed by Sim Settlements City Plan. This is an engine limitation. --When you pick up a Layer Handle, all of the items that you will be moving will highlight green, similar to the highlight that happens when you group select in workshop mode. WARNING - Do NOT store the layer handle. Doing so will cause all attached items to be scrapped or stored in the workbench. Once a Layer Handle exists in a settlement, it should never be removed. Layer -----Handles will autohide themselves when you exit workshop mode. ---It will attempt to clone all items attached to the layer handle where they are at the time you pressed the Clone Key. Wait for the layer handle status to turn green before moving. ---If the items are being cloned to the same layer the handle is for, those items will not be connected to the layer handle. --To connect new items to a layer handle, simply place the layer handle again, and it will connect everything on the layer to itself. -Undo/Redo will now support undoing/redoing cloning a group of objects via the Layer Handles or Duplicate Layer functionality. Items created via bulk cloning (duplicate layer/cloning a layer handle) will become disconnected from the bulk undo possibility if you move or scrap them independently. This may change in the future, but tracking this is quite complex and can result in potential memory leaks if not done correctly. --Just like other Undo/Redo actions, the bulk undo/redo stack is cleared when you enter a new settlement. --WARNING: Undo/Redo does not currently work with moving objects via a Layer Handle, but that is planned for a future update. ---Active Layer [Default] - Items will be cloned to the active layer. ---Source Layer - Items will be cloned to the same layer the originals are on. ---New Layer - WS+ will attempt to create a new layer and clone to that new layer. If no new layer slots are available, the items will be cloned to the default layer. ---Ask Me - You will be prompted to select how to handle the cloned objects. --Highlight Items When Layer Handle Held: Allows you to turn off the highlighting of items when picked up via a Layer Handle. -Added proper messages to Undo/Redo instead of relying on Debug messages. This is in preparation for a future update where support for Undo/Redo is added to Xbox. -Fixed an issue where fall damage could be permanently disabled for your character after entering Workshop mode. If you find Fall Damage is still off after this patch, unequip any item that affects fall damage (such as the Free Fall legs), then toggle in and out of workshop mode and wait about 15 seconds. -The Prevent Fall Damage setting will be ignored if you have equipment that modifies fall damage, this will prevent a bug where it can essentially make your armor’s fall damage ability useless until you enter/exit workshop mode without it. -Fixed an issue where various items that were in your settlement the first time you visited it after installing WS+ could end up hidden until you toggled the default layer. -Fixed a bug with the option to only use the Layer HUD in workshop mode (previously the setting would not toggle correctly). -Will now attempt to detect if the player has a jetpack equipped, and automatically avoid toggling on Flight if so. Flight is not supported while a jetpack is equipped, and can result in controls not working correctly until you reload. -Added Freeze Time in Workshop Mode option. This will drop the time scale and AI/Animation time to a fraction of what it normally is while in Workshop Mode (disabled by default). -Added Toggle Freeze Time hotkey option to MCM. -Added Unlimited Carry Weight in Workshop Mode option. This will virtually remove your carry weight limit while in Workshop Mode, this will allow you to keep moving at full speed when you arrive at your settlement. -Renamed Toggle Active Layer Highlighting to Toggle Automatic Layer Highlighting, to help differentiate it from Toggle Layer Highlighting which responds to a hotkey vs the Automatic which happens when you change the current active layer. -Converted the Unlink/Relink and Highlight/Unhighlight into toggles to reduce the number of hotkeys you’d need to make use of all of the features. If you had previously hotkeyed any of those, you’ll need to reset them as the hotkey signatures have changed. -Fixed a bug where the Remove All Layers tool would end up leaving a pink highlight on all items until you cleared it with a hotkey call. If you start the game in a settlement the first time you load up WS+, it will now scan that settlement and prepare the Undo feature. You will receive a message in the corner that says “[WSPlus] Undo support ready.” when it finishes. -Xbox players will now correctly receive the “[WSPlus] Undo support ready.” message. TLDR; Placing down full buildings or creating a bed from cigarette wrappers isn't realistic or immersive anyway, so let's go all out and turn this into a proper tool. Workshop Mode becomes more like a creative tool, letting you move around freely and take advantage of tons of hotkeys to enhance your building experience. * You can use some features without MCM - but it is highly recommended due to the hotkey system it provides. Now open source! If you'd like to contribute to the mod or get some ideas of how you can tap into Workshop Framework (which was used as the foundation for WS+) head to the Github repository﻿! Workshop Plus will turn you into an invisible hand in the game world while you are in workshop mode. All of the options below can be turned off. - Flight: You actually fly while in Workshop Mode, no tcl necessary. This means you can still interact with things over and over without having to toggle tcl on and off. - Super Speed: You move incredibly fast while in Workshop Mode, to quickly get to the sections of the settlement you want to work on. Can be set to +50%, +100%, or +200%. - Invulnerability: You won't take damage, or more importantly rads while in Workshop Mode - no more accidental death when working on your settlements. - Invisibility: You will be completely ignored by NPCs while in Workshop Mode, so you can focus on your building. This also gives you the power to convert the game into full blown Tower Defense with the appropriate mods. - Clone: Pick up an item, press a key, you have a copy. If you have Place Everywhere, this even works with things you don't have construction records for - that means you can clone every item in the game, even normally scrap only things, or props and buildings from Sim Settlements! - Undo/Redo: Over 1000 levels of undo support! Set up hotkeys and you can undo movements, placements, and scrapping with the press of a button. ﻿ ﻿- If you undo the movement of a wired object, the wire will still be where it was when you moved the object - you'll need to reattach the wire yourself - but the power will still run even if you don't. ﻿﻿- Each time you enter a new settlement, your undo history is cleared. Layers allow you to separate items and quickly hide or even duplicate them! This gives you the power of programs like Photoshop in your settlement. - Duplication: Entire Layers can be duplicated, allowing you to create a structure, make a copy, and then thanks to the toggle Display/Linking move your copy all at once anywhere you want in your settlement! - Deletion: Transfer items between layers or even scrap them all in one go! - Visual HUD: HUDFramework integration to provide a visual module to help you use the Layers system. - Toggle Display: Hide all of the items on a layer instantly, then re-display them again just as quickly. - Toggle Linking: Unlinked items won't be picked up by Group Select, so you can separate out your items on to different levels so you can pull out the groups of items you want and move them in a group. - Highlighting: Highlighting tools and toggles help you quickly identify which of your items are on a given layer. *While this isn't the holy grail of being able to actually save in workshop mode and avoid having to wait for the transition - it can at least save you some steps and hopefully prevent you from ever losing much work in your design when the game engine decides to crash. - Automatically exits you from workshop mode, and then puts you back in when it finishes saving. - Hotkey available with MCM. 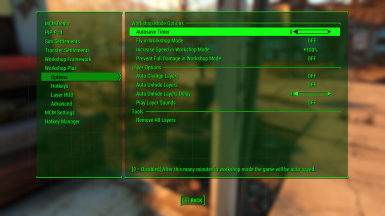 - Autosave option allows you to set a certain amount of time in Workshop mode where the game will automatically save. The "God Simulator" things will happen automatically when you enter Workshop Mode. To control the options, either access the MCM menu, or if you aren't using it, go to a Chem Workbench and craft the Workshop Plus Controls holotape under Utility. To use the Layer system without hotkeys, go to a Chem Workbench and craft the Layer Control Module under Utility. You can Favorite this item and activate it to bring up options. MCM allows you to use hotkeys in Workshop mode and is definitely the preferred way to control layers - so if you find it obnoxious to jump in and out of Workshop mode to work with layers - grab MCM and set up those hotkeys! - Continue to expand on the features available to make Workshop Mode feel more and more like a creative tool. - Copy layers to other settlements. - Export layers for importing into different save files. The Rise of the Commonwealth team for constantly bitching about how bad Workshop Mode is, which inspired me to make this!